Can I Delete a Presentation? Sure! 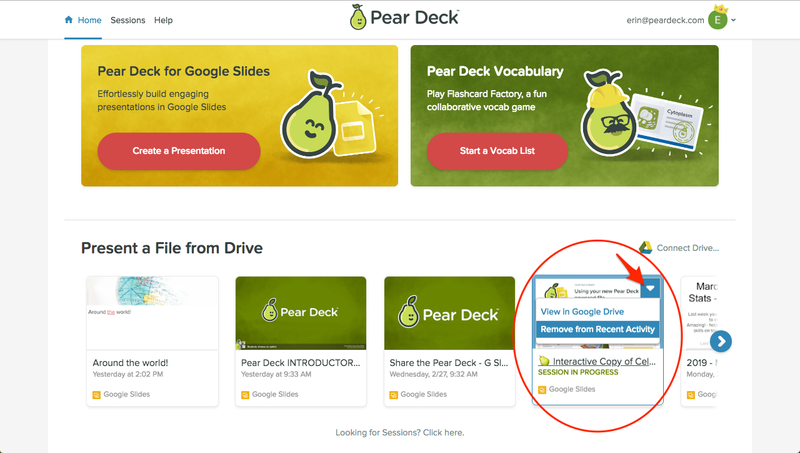 Pear Deck presentations live in Google Drive, which means you organize, share, delete, and restore them all in your own My Drive account. On the Pear Deck Home screen, you can hide recent files, but not delete them. Click on the trash can. Go to the menu on the left side of the screen and click on Trash. Click the Restore from trash button. Go to Pear Deck Home. Hover over the top right corner of the file thumbnail. Click Remove from Recent Activity. This will remove the file from your Pear Deck Home, but not delete it. Can I Delete a Session? Can I Organize My Pear Deck Files into Folders? Can I Transfer or Switch My Account?